Roses, with their beauty and versatility, are now one of the most popular of all home garden plants. If your garden has at least six hours of sun a day, good air circulation and good drainage, you should be able to successfully grow a variety of beautiful roses. When choosing roses for your garden first decide what color you want, if you want fragrance and what type: bush, climbing, patio tree or groundcover. If you have no idea what you want, come visit Evergreen Nursery where they are blooming and see and smell for yourself. Evergreen Nursery carries over 200 varieties of roses, planting over 20,000 annually. Although, roses are available as bare root plants as early as December from supermarkets, other garden centers and big box stores, Evergreen’s experts do not recommend purchasing them this way.They are more likely to be dried out or have premature growth due to warm storage temperatures and poor care while on the shelf. By special arrangement Evergreen Nursery purchases thousands of bare root roses early in the season, then plants them in containers as soon as they arrive so customers can be sure they are well established to plant in their garden at the right time to insure a longer blooming season. Roses can also be purchased later in the growing season for those who prefer to see the flower bloom and smell the fragrance. Though buying container grown roses is usually a more costly approach from many vendors, Evergreen’s volume growing and cost conscious tradition make the cost of a blooming, full-sized container rose about the same as an equal sized bare root with no risk of survival or disappointment. Our locations in Carmel Valley, Oceanside, and Blossom Valley have a great selection like: Angel Face, Christian Dior, Dark Knight, Tropicana, Chicago Peace, and of course Iceberg(see photo). Iceberg is by far the best overall performer in the landscape. It blooms forever and is one of the easiest roses to care for. We sell our bush type roses in 2 gallon and 5 gallon containers. We also stock a great selection of 2 gallon groundcover type roses and 7 gallon patio tree roses. There’s always something to do for roses in Southern California; whether you’re enjoying the flowers in the summer or selecting new ones to plant in your garden during the winter, we have something to do each month to ensure the health of these beautiful flowers. From December – February, you will see bare root roses at the big box stores. Evergreen Nursery does not sell bare root roses. Why, you may ask? We believe that by planting the bare root plants immediately, the roots won’t dry out, have time to become established in the container which increases their chance of survival. That way, when you select a rose at our nursery in the summer, you will see it blooming and growing in containers. For roses already in your garden, this is when you need to prune them HARD. Select the 3-5 strongest canes and then cut everything else off the plant. The canes you choose to keep need to be cut back to ½ their height. This allows the plant’s energy to go towards root and cane production, making it a healthier and stronger plant. If you’re going roses in pots, now is the time to renew the potting soil. Clean up any debris around the base of the roses. Spray with a dormant fungicidal spray as a preventative measure to control diseases. Then add a new layer of mulch around the roses. No need to fertilize now since they are resting. If you didn’t get your pruning or dormant spraying done in January, do it now. New growth will come slowly due to cool temperatures. That’s ok since they’re still resting. However, if you have roses in pots, they may be sending out some new growth due to the warmer temperature of the potting soil. time to add fertilizer. Follow the manufacturer’s instructions. We carry Green All Rose & Flower Food and E.B. Stone Organics Rose & Flower Food. 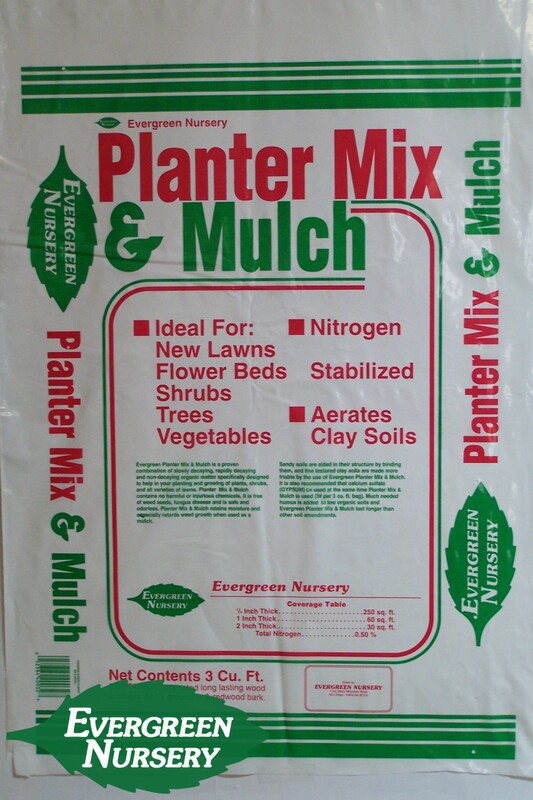 Add some compost, such as Evergreen’s Planter Mix & Mulch to add organic material to the soil. Check for pests and fungal diseases, such as aphids and/or mildew, and treat accordingly. Another pest that may be attacking your rose leaves is the rose slug. Not an actually slug, nor a caterpillar. It's the larvae of the sawfly and just like the children’s book, The Very Hungary Caterpillar, these larvae will feast on your rose leaves…however, it WON’T turn into a beautiful butterfly. Blast these critters off the leaves with water, use an insecticidal soap or Green Light’s Lawn & Garden Spray with Spinosad. Well, those pesky little critters aren’t going to give up too quickly, so be on the look-out again this month for aphids and rose slugs. Treat accordingly. Another pest that may have moved in is spider mites. If you see “salt & pepper” on the leaves, you know they’ve arrived. Spray with water or use a miticide. Continue spraying fungicide for mildew or fungal diseases, such as powdery mildew, black spot, and rust. Morning is the best time to spray and avoid windy conditions. On the positive side, you should be seeing some blossoms this month! Enjoy. The initial bloom cycle is over so it’s time to deadhead (cut off the old blooms). You can follow the “5-leaflet rule” where you cut the stem back to the first or second 5-leaflet. Or prune to keep the interior of the bush open allowing for air circulation. Also, for hybrid tea roses and climbers, prune up from the base to about 8” to keep air circulation going at the soil level. Fertilize with fish emulsion (1 Tbs/gallon of water). While this may have an offensive smell, your roses will thank you for it. It provides nitrogen for healthy leaves, phosphorus for beautiful flowers and strong roots and potassium for stronger cell structure, plus other micronutrients that plants need. Water your roses as it gets warmer. A general guideline is to water 2-4 times per week if the temperatures are under 90°, above that and you’ll need to water every day, possibly twice a day. This schedule will also depend on the type of soil you have, wind conditions, rain, etc. Roses do not like to be sitting in water so judge accordingly. May Gray has turned into June Gloom. Be on the look-out for mildew and other fungal diseases. If you have mildew on your roses, clip off the infected foliage since fungicide sprays can’t kill it, they only prevent it. Sterilize your clippers with a disinfectant wipe, spray or diluted bleach solution. Water in the morning so leaves have a chance to dry during the day. Come into the nursery to see our rose selections in full bloom! Choose the ones you like, take them home and plant them in your garden! 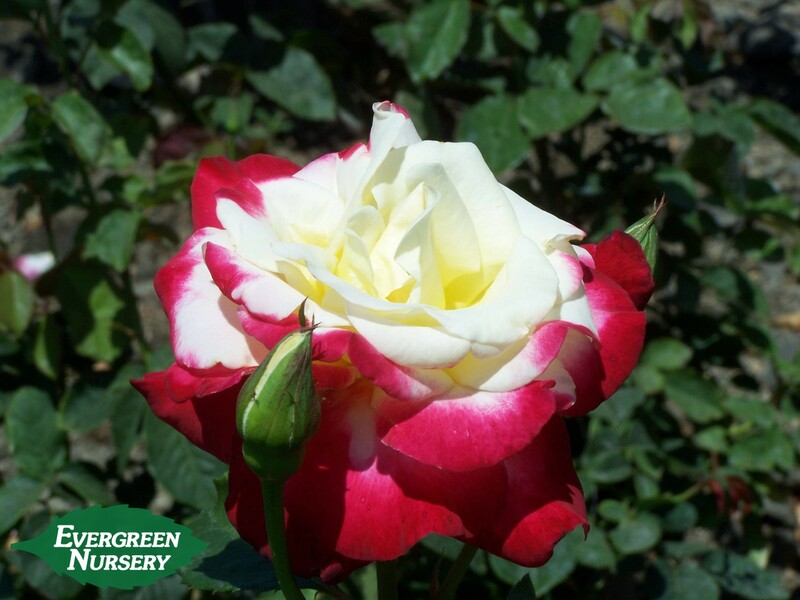 Fertilize with fish emulsion or the Rose & Flower Food that was recommended back in March. Water, water, water! Be sure your roses have plenty of water for the warm days of summer. Continue to monitor for insects and diseases. A new critter that may have snuck into your garden is the grasshopper. If you notice the buds are being eaten or the edges of the leaves are being chewed, you may have a grasshopper or two who have invaded your garden. Forget about using sprays on these armored insects…they only way to get rid of them is to catch them and chop their heads off or smash them with a heavy, blunt object. Not kidding! These guys will eat you out of house & home unless you take action! Be on the look-out for spider mites and thrips. Indications of thrips are slight brown edges of rose petals. Spray with spinosad to control the thrips and spray with water jets or miticide for the spidy mites. Do not spray if temps are over 85°F. Deadhead the old blooms but keep as much foliage as possible, especially in hotter interior areas, to provide shade which keeps the rose bush cooler. Late in the month, prune back 1/3 of the height to promote a beautiful fall bloom. Follow up with fish emulsion fertilizer or E.B. 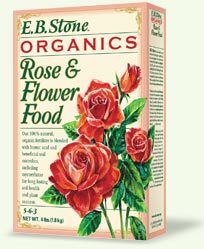 Stone Organics Rose & Flower Food. Keep the soil moist by watering as needed. If you didn’t get around to pruning back 1/3 of the bush in August, do it now so you’ll have another bloom cycle in October. Watch for aphids (again! ), cutter bees (big round holes in the leaves), or catapillars (holes in the buds). Treat by spraying with jets of water or removing the damaged buds. Spray fungicide to prevent & control mildew. Follow the manufacturer’s instructions. Follow up with organic fertilizer. Feed for the last time before dormant season. Continue watering as needed and adjust for Santa Ana conditions. Go to a Rose Show! Roses will continue to bloom. You can either choose to deadhead the spent blooms or leave on the bush for rose hips. Continue to water if rains are slow in coming. Repot roses growing in containers. Clean up garden debris around your roses to control insects and diseases from overwintering in the soil.